When I turned 52, I dared myself to do 52 things I’d never done before. Preparing Thanksgiving dinner was one of them. My place in the preparation of the Thanksgiving meal has always been that of scullery maid, table setter, or dishwasher. My mother’s little sidekick, I wholeheartedly embraced these roles, being far more interested in how to fold a napkin than in making a perfect pie crust. I relish setting a gorgeous table with my damask linens, Wedgewood china, and monogramed flatware inherited from a riches-to-rags paternal great grandmother. 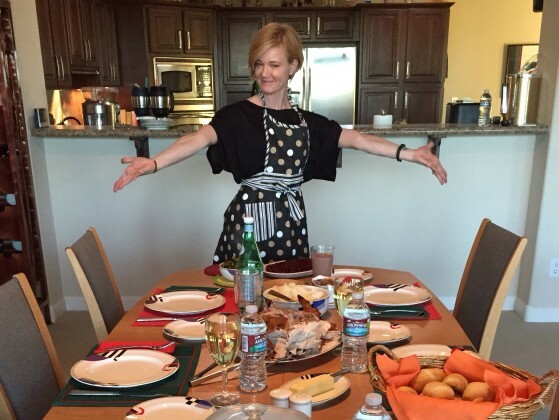 And one of the secrets to my 20-plus years of happy marriage is that, after a disastrous first dinner party in which my husband laid the table while I cooked, we switched roles and have never looked back. When it comes to holiday cooking, my women friends fall into two camps: resenters and revelers. I’ve always been a happy agnostic. So why did I finally step into the fray? Last April, when I turned 52, I dared myself to do 52 things I’d never done before. As I made my rock climbing, salsa dancing, paddleboard yoga bucket list, I was inspired to see what all the brining-versus-basting fuss was about. Then I remembered that we’d already committed to flying from our Maryland home to Tucson, Arizona, to have Thanksgiving with my in-laws. Never one to back down from a dare, I raised the stakes: no time for advanced prep, no familiarity with the kitchen, no china and silver to dress up any culinary failings. As I sought out favorite recipes and tips from Facebook friends, I confess to making some “popped her cherry…er, cranberry” jokes that would have made the matriarchs in my family blush. But that, no doubt, also would have made them recall their first times. I don’t know how old my grandmother, the eldest of six, was when she first hosted Thanksgiving but she was of the if-you-want-something-done-right-do-it-yourself school. As a child, my mother learned to stay out of her mother’s way until she “got her pretty on”—code for bathed, coifed, and ready to receive guests—after the stress of the cooking was over. My precocious mother was 24 when her mother handed her the reins. After staying up all night to cook, she served 43 guests, most of whom were seated at one long table (leafs in) in our formal dining room with the French doors. Even with her mother, grandmother, and assorted aunts hovering over her tired shoulders, the meal was perfection, from Butterball turkey to Southern cornbread dressing to the brown-sugar-pineapple-yam casserole and lacy-edged pumpkin and pecan pies. I was five, sitting at the kids’ table in the living room, but I still remember that day. A reveler, my mother enjoyed both the stress and the satisfaction so much that she invited everyone back for Christmas. Like my grandmother, I’m of the if-you-want-something-done-right school. I’ve just always thought no one could do it better than my mother, who possesses the ability to plan like General Patton and cook like a Southern Julia Child. Rare is the Thanksgiving when the two of us have been apart. Yet even as I knew I would miss her, I also knew not cooking in her shadow would take some of the pressure off. The blank slate of a foreign kitchen and my mother-in-law’s helpful but laissez faire attitude accounted for the absence of churn I felt as my husband, teenaged kids, and I boarded a plane for Arizona. Our late Wednesday night arrival had necessitated that my parents-in-law do all of the shopping beforehand, using lists I’d sent in advance. Although I’d already determined the menu, work deadlines kept me from looking at a single recipe until Thanksgiving morning, when I clicked on the computer folder I’d labeled months back and pulled The Joy of Cooking from my mother-in-law’s shelf. I was sticking to the basics: turkey, dressing, mashed potatoes, gravy, jellied and whole cranberry sauce, honey mustard Brussels sprouts, spinach goat cheese salad, and crescent rolls. The most freighted dish would be my grandmother’s brown-sugar-pineapple-yam casserole, synonymous in my mind with the holiday itself. While my Facebook friends posted photos of bacon-wrapped turduckens ready for roasting and chocolate bourbon pies fresh from the oven, I focused on scheduling, believing that timing—not talent—would be my saving grace or downfall. I worked backward from 5:00 pm when, with any luck, dinner would be served. From among the many turkey roasting methods empathetic friends had sent, I chose a high-heat Gourmet magazine option, which required no basting and promised moist meat with crispy skin. Unlike my mother and grandmother, I also chose to put my pretty on before I started cooking—an attempt to never let ‘em see me sweat. With oven preheated, salad made, potatoes peeled and diced, yam casserole prepared, it was time for the main event. Pausing only momentarily upon reading “Remove any stray feathers or quills,” I dove in, cutting the bag from a fresh, 14-pound, free-range turkey. After years of being a bystander, I’m here to tell you that no matter how many times you’ve witnessed the turkey’s stuffing and trussing, gazed upon the golden goodness of a bird pulled from the oven, watched the carver pile the white and dark meat onto a platter and pronounce it moist or dry, and battled cousins for the wishbone, until you’ve reached into the bird’s raw, cold cavity in search of the giblets you know nothing of Thanksgiving turkeys. By the time the bird was ready, all the serving dishes and utensils had been laid out, two loads of dishes had been done, and the mashed potatoes whipped to perfection. I didn’t know if anything would taste as good as my mother’s but it turned out all those years as her scullery maid had allowed me to mirror her calm and executive skill. Like mechanics looking under the hood, my mother-in-law and I watched the needle on the meat thermometer rise to 170 degrees after I’d plunged it into a golden thigh. Turkey resting, the dressing, Brussels sprouts, yams, and rolls went into the oven. Andrea Jarrell’s essays have appeared in The New York Times; The Washington Post; The Huffington Post; Brain, Child; and Narrative among other publications including a new anthology My Other Ex. She’s at work on a memoir that builds on her New York Times “Modern Love” column – “A Measure of Desire.” Follow her on Twitter @AndreaJarrell.